From the New York Times bestselling author of the continuation James Bond novels comes a new novel of suspense about coming-of-age in the 1960s, and the neighborhood street where first love, a child abduction, and abuse collide. As Shelby travels home to Texas for the unnerving reunion, she steps back into memories of her past, recalling her five-decade-long relationship with Eddie in order to understand what led the beautiful but troubled boy who lived across the street to become a murderer. Shelby and Eddie used to visit an abandoned fallout shelter in his backyard, their "secret hiding place" where they could escape Eddie's abusive father, enjoy innocent playtime, and, later, adolescent explorations. As they grow increasingly close, a tragedy occurs one July fourth, an event that sets in motion a lifelong struggle against an Evil—with a capital "E"—that has corrupted their all-American neighborhood. "A first class thriller craftsman." "[An] unsettling thriller . . . readers will keep turning the pages." "This stand-alone is a surprising but satisfying departure for genre veteran Benson, the author of multiple James Bond pastiches as well as the acclaimed Black Stiletto series. The novel offers a compelling meditation on lifelong friendship, love, and tragedy as it details the evil that destroys two families." "Raymond Benson pulls at the heartstrings in this tragic tale. Peppered with nostalgia, love, heartbreak, and melancholy, the narrative is profoundly entrancing and fast-paced. Part mystery, part reflective coming-of-age, The Screts of Chicory Lane ensnares readers in its dense web, refusing to let go, even long after its jaw-dropping conclusion." "Where a novel lands on a bookstore shelf is defined by label: mystery, suspense, thriller, horror, literary. 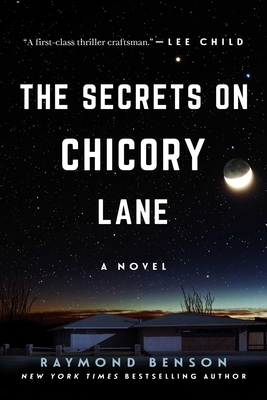 Raymond Benson’s The Secrets on Chicory Lane is all of those things, and a little more. . . . Benson sculpts perfect sentences and scenes, memories and emotions dripping off the pages. I found parts of myself inside it . . . snatches of my childhood, awkward bits from long years ago . . . . A damn fine book." "In a bold move away from the thrillers for which he’s best known, Raymond Benson offers readers a heartfelt and tragic tale. Across decades, the dark secrets on Chicory Lane shape and misshape the lives of all who live there. Benson, a master of suspense, has crafted a story as compelling as any thriller but with a depth of feeling few thrillers achieve. And the ending, I guarantee, will leave you breathless." "The Secrets on Chicory Lane has a premise to envy: A killer and the girl next door meet one last time before execution day. How much do we know the people we have spent our lives with? Raymond Benson explores the nature of evil and how little chance we have to recognize it when we see it, or escape it, if we do." "Pitch-perfect characters drew me in; unrelenting suspense left me breathless by the end. Raymond Benson is a master storyteller." "A harrowing tale of childhood physical and sexual abuse, and descent into madness . . . If dark is your thing this well-written tale of a sad, wasted life will make you count your blessings." "A wonderfully written and heartbreaking account . . . as good a coming-of-age novel as I have read for many a year, but Benson’s skill as a storyteller doesn’t stop there. He delivers the poignancy and unbearable sensitivity of first love and sexual awakening. His account of how children escape from the shackles slapped on by their parents is masterly. . . . There is also a very clever murder mystery, which isn’t resolved until the last few pages, and then the resolution brings only heartbreak." "The story is just so brilliantly written that you can’t finish one chapter without reading the next three, and so on and so forth. . . . A powerful novel of childhood trauma seeping into an adult’s psychology. . . . Tremendously moving."